Top Cow’s Genius was one of the most compelling comics of 2014, a weekly miniseries that debuted at a time when it was especially relevant to current events. Marc Bernardin, Adam Freeman, and Afua Richardson’s story of “the greatest military mind of our generation” uniting the gangs of Los Angeles to take on the LAPD had even greater impact in the midst of the protests in Ferguson, Missouri, after the shooting of Michael Brown by a police officer. (You can read more about the original Genius in this Big Issues piece.) 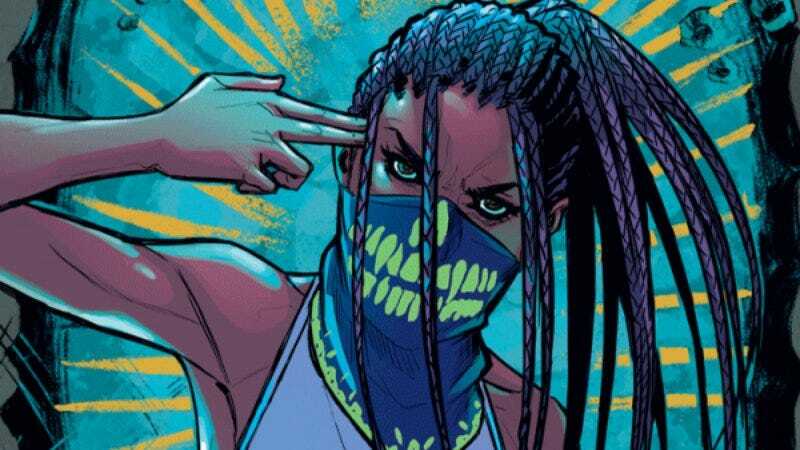 The political climate has only gotten more heated since then, and 17-year-old Destiny Ajaye is back in Genius: Cartel, a five-issue miniseries that takes her off the streets and puts her in the employ of the government she resents. Bernardin and Freeman are back writing the script, joined by the new art team of Rosi Kampe and colorist Brad Simpson, who deliver visuals that are slightly more traditional, but also clearer than Richardson’s work. That chaotic element worked for the first series, but as Destiny is forced into a more rigidly structured environment, the artwork shifts to reflect this change. Like its predecessor, Genius: Cartel moves at a breakneck pace, jumping back in forth in time to build suspense and anticipation. This exclusive preview of next week’s Genius: Cartel #1 begins with a splash page of Destiny back in action saving two girls in Mexico, then flashes back to catch readers up on Destiny’s story before she begins her training at The Madrasa Institute. Kampe brings a lot of intensity to Destiny’s character throughout this excerpt, and the page recapping the events of the last miniseries condenses a lot of information in an exciting layout with vibrant coloring from Simpson. The contrast of orange and blue adds tension to Destiny’s car rides to her new life, and the final panel of Destiny descended down an elevator shaft to start her training reinforces this idea that she’s falling rather than rising. This is Destiny, though, and with a mind like hers, she’ll be able to turn this less than ideal situation into something she can work with to reassert her dominance.